Be the first to share your favorite memory, photo or story of Claiborn. This memorial page is dedicated for family, friends and future generations to celebrate the life of their loved one. 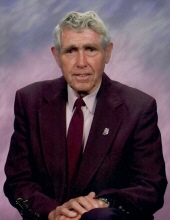 Claiborn Marshall “Clip” Wamsley, age 93, of Monterey, passed away January 27, 2019. Clip was born March 19, 1925, at home, in Springersville, Indiana to William Ginn Wamsley and Ruby May Cullins Wamsley, both deceased. He was a 1943 Graduate of Alquina High School and went on to serve as a Signalman in the U.S. Navy from 1943-46 during WWII. He graduated Franklin College in 1950 on the G.I. Bill and one week later started working at First National Bank of Monterey. He was currently the Chairman and CEO of FNB of Monterey. He has been a member of the Monterey United Methodist Church since 1950, received the Sagamore of the Wabash, Past Treasurer of Monterey Lions Club, Past member of the Monterey Volunteer Fire Dept., official score keeper for the Monterey High School and Culver Community High School from 1962-2010, past President of the State of Indiana Community Bankers Assoc., Pulaski County Sheriff Merit Board, and a trustee of the Riverside Cemetery in Monterey. He was an avid golfer and outdoorsman who loved hunting mushrooms and arrowheads. On December 19, 1947, in Franklin, Indiana, he married his wife of 71 years, Alice Jane Mishler. She survives. Also surviving are his children, George Wamsley (Marian), John Wamsley (Sherrill), Ellen Lindvall (Brent), and Mark Wamsley (Suzy), 14 grandchildren, 28 great grandchildren, sisters, Eileen Irrgang (Jack) and Marilynn Miller (Bob), and a sister in law Virginia Wamsley. He was preceded in death by brothers Don Wamsley and Larry Wamsley (Vi), and a sister, Phyllis Lambert (Byron). Visitation will take place Friday, February 1, 2019 from 2-6pm (CT) at M.C. Smith Funeral Home, 153 E. Washington St., Knox, IN. Funeral services will take place Saturday, February 2, 2019 at 11am (ET) at Monterey United Methodist Church. Burial will take place Monday, February 4, 2019 at 1pm (ET) at Big Cedar Cemetery in Brookville, Indiana. In lieu of flowers, please make donations to the Monterey United Methodist Church. To send flowers or a remembrance gift to the family of Claiborn M. "Clip" Wamsley, please visit our Tribute Store. "Email Address" would like to share the life celebration of Claiborn M. "Clip" Wamsley. Click on the "link" to go to share a favorite memory or leave a condolence message for the family.